As I am not feeling 100% and it is getting cold, I wanted to make something warm and meaty tonight. I never had or even heard of zoervleis (literal translation: sour meat) before. It is a traditional dish from Maastricht - which is a stew of beef with onions, vinegar, ontbijtkoek, and apple (or pear) syrup. It is usually served with apple sauce, and (home-made) fries with mayo. Another way is to pour the zoervleis all over your fries, and serve it with a simply green salad. As I was feeling lazy, I simply served this with boiled potatoes and steamed broccoli. This recipe was picked as the "best recipe of traditional Dutch dish", but it just didn't work for me. I didn't like the sweet and sour taste at all, as in my opinion beef stew should always be hearty. Maybe I didn't cook it right, but no more zoervleis in my kitchen for sure! 1. Add 300ml of water, vinegar, cloves, and bay leaves to a large bowl. Add beef, and season with salt and pepper. Let it marinate for at least 24 hours in the fridge. 2. Remove beef from the bowl and dab dry. Remember to save the marinade for later. 3. In a Dutch oven, brown the onions with some butter. Remove and set aside. 4. Brown the beef, then add the onions and marinade. Bring it to the boil, and let it simmer over low heat for 2 to 3 hours. Stir occasionally. 5. 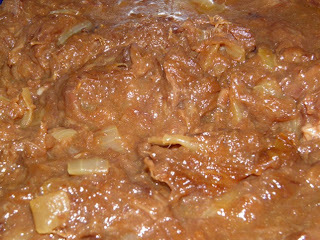 When the beef is done, add the ontbijtkoek crumbs to thicken the sauce. Season with appelstroop, and salt and pepper to taste.